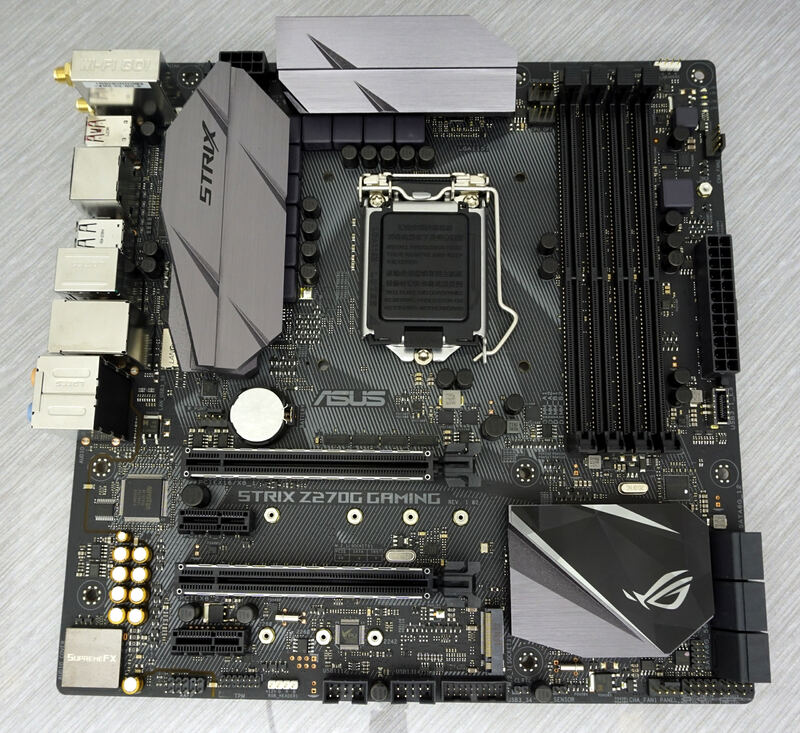 Asus’s engineers were tasked with making the ROG Strix Z270G Gaming both practical and visually appealing - a combination of which can be difficult to achieve. 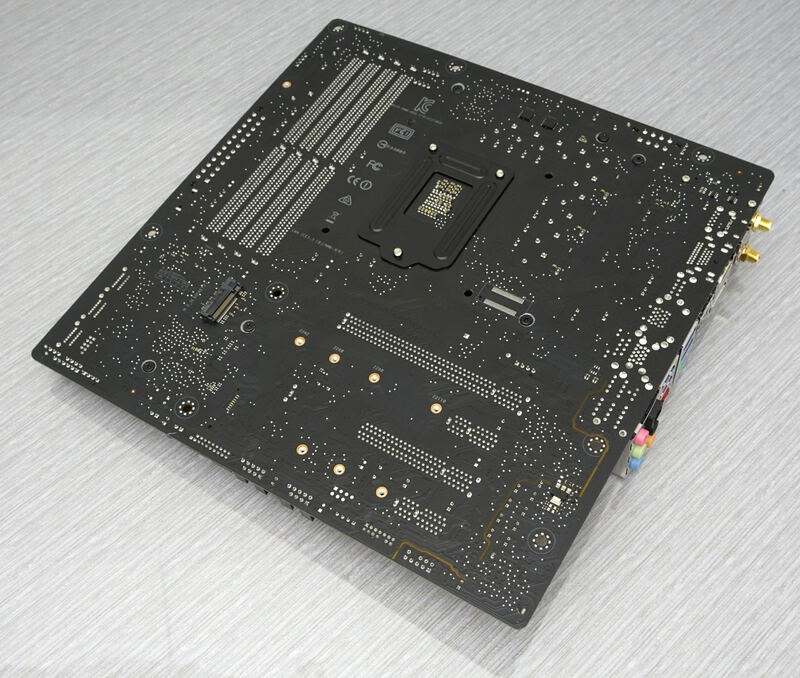 Aesthetically they went with an all-black PCB with abstract-shaped, gunmetal/black heatsinks. Most of the capacitors are painted black as well, leaving only the golden capacitors of the audio circuitry which stand out. RGB lighting is one of the major features of this motherboard mainly through headers, but its onboard lighting is limited to the logo on the chipset heatsink. It has two RGB headers, one at the top right corner and one near the bottom left corner of the PCB, for two optional RGB strips that it can control via the Aura Sync system/software. 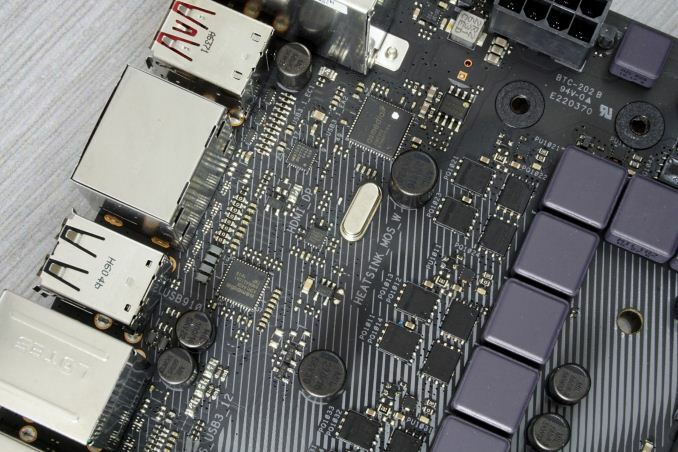 In order to make the design as practical as possible, the designers of this motherboard placed almost every header across the bottom edge of the motherboard. From left to right, we can see the front audio panel header, the TPM header, one RGB strip header, two USB 2.0 headers, one USB 3.0 header, a thermal sensor header, a fan header and, finally, the front panel I/O header. There also is USB 3.1 (10 Gbps) header to the right side of the motherboard, right below the ATX connector. 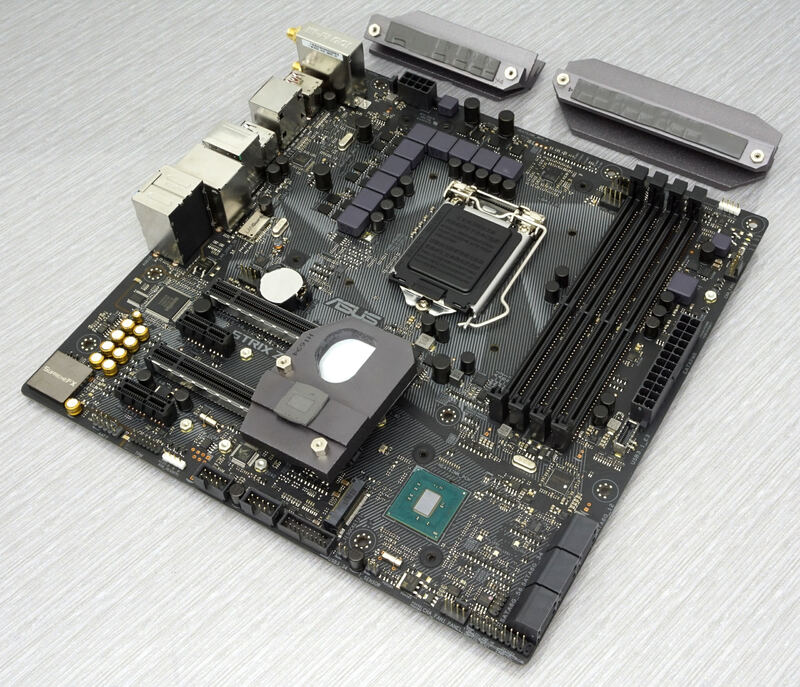 This is the first and only Z270-based motherboard that we have seen to this date that features a USB 3.1 front panel header, in this case provided by an ASMedia ASM2142 controller. Six SATA ports can be seen facing towards the right of the motherboard. There are no SATA Express ports, most likely because Asus does not appear particularly convinced that they will gain any traction in the near future, as the company does not implement them even on larger designs where space is not such an issue. 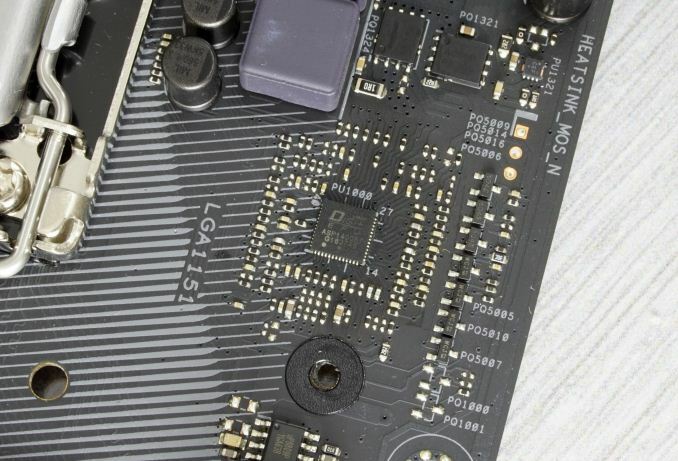 There are two PCIe ×4 M.2 slots, one right below the second full-length PCIe card slot and one at the back side of the motherboard. The first supports up to 80 mm long devices (2280) and the latter up to 110 mm long devices (22110). Note that only the slot higher up the motherboard supports M.2 SATA devices and installing such a device will disable one of the SATA ports. Asus is particularly proud about the “SupremeFX” audio circuitry that is installed on the ROG Strix Z270G Gaming. Its heart beneath that metal shielding is a Realtek ALC1220A CODEC, supported by two Texas Instruments amplifiers (RC4580 + OPA1688). At this point, we should note that the ALC1220A is identical to the ALC1220, but the 'A' is an ASUS specific implementation that has been manufactured by Realtek in co-operation with ASUS. What this does is remove extraneous features that ASUS does not need, such as an I2S output that would be useless given the absence of a DAC-driven device. The ALC1220 codec itself is not particularly unique, as many Z270-based motherboards are currently using it, but the ALC1220A certainly is an ASUS-specific implementation. Asus’s engineers have placed a lot of effort on maximizing the codec’s potential via shielding, power regulation, and filtering techniques. The left and right channels are on separate PCB layers and Nichicon supplies the golden, audio-specific capacitors. 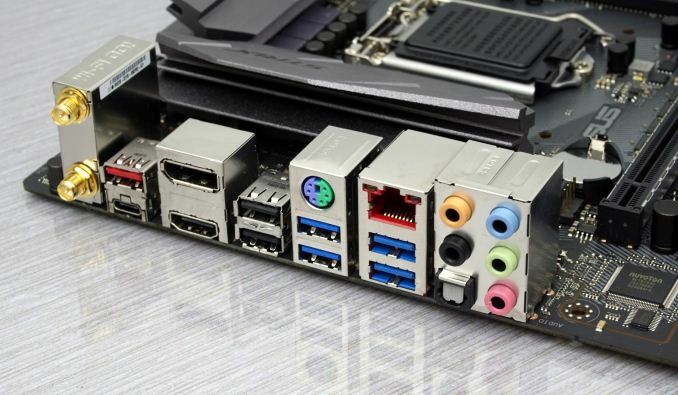 The rear panel of the Asus ROG Strix Z270G Gaming is a little strange, as Asus decided to place the combo PS/2 port right at the middle of the ports array rather than at its top. Other than that, at the top of the array we can see the block that houses the Qualcomm Atheros QCNFA364A controller and has the fixings for the WiFi/Bluetooth antenna, followed by the Type-A and Type-C USB 3.1 ports of the ASMedia ASM2142 controller. Then follows a block with the two display outputs of the motherboard, a DisplayPort 1.2 and a HDMI 1.4a monitor connector. The lack of an HDMI 2.0 port may be disappointing for users who want to build gaming PCs that double as entertainment systems connected to a large TV nearby - hopefully, the discrete GPU will be left with a spare HDMI connector for that. The middle section of the rear I/O panel mainly consists of two USB 2.0 ports and four USB 3.0 ports. There is a single red LAN port, driven by the popular Intel I219-V Gigabit LAN controller. Behind that port, Asus installed their “LANGuard” circuitry, a safety layer that acts as a surge protector for the controller. Finally, the last block is home to five 3.5 mm gold-plated audio jacks and an optical SPDIF connector. The CPU power circuitry of the ROG Strix Z270G Gaming is a powerful 10-phase (8+2) design, with the phases distributed to the four different input voltages that the modern 1151 CPUs require (Core, I/O, Graphics, and System). The DIGI+ ASP1400BT VRM controller is unique to Asus. The 4C06B and 4C09B MOSFETs are supplied by ON Semiconductor, a common sight on many recent Asus motherboards. The black solid-state capacitors appear to have been rebranded and are coming from a manufacturer that we could not identify. They are branded as “MIL”, referring to “military grade components” and suggesting that they comply with the US MIL-STD810 standard. This website is a prime example of what happens when you hire millennial's to your company, slow , shoddy, confounding, and quite frankly idiotic work ethic. Higher-end motherboards have a selection of features that are not present on lower-end motherboards. Like in other markets, price variation exists because of feature differentiation. Halo products are always the most expensive. You can find reasonably priced parts for both companies mainstream sockets. New Z270 and X370 boards both start at slightly over $100 on Newegg; down to $50ish for the entry level chipset in each family. Plenty of Z270 boards in the $100 - $150 price range. There are AM4 boards in the $250 - $350 price range available as well, if you want to spend the money. So with the current crop of Intel/AMD CPUs, spend $300+ on a mobo for like a 10% OC while turning my PC into a space heater = lol no thanks, I got way better things to spend money on. Good catch there. This is the right one, and only $189. Wow, the day has finally come where Asus is trailing Asrock. I’ve always been a big fan of asrock boards. And in my opinion they have better customer and technical support. Asus support is the worst I’ve ever dealt with.